The American Society of Civil Engineers (ASCE) is a tax-exempt professional body founded in 1852 to represent members of the civil engineering profession worldwide. Headquartered in Reston, Virginia, it is the oldest national engineering society in the United States. Its constitution was based on the older Boston Society of Civil Engineers from 1848. Purpose of the group is the advancement of the science and profession of Civil engineering and the enhancement of human welfare through the activities of society members. Worldwide, out of 196 countries in the world, ASCE has members in 177. Kristina L. Swallow, P.E., ENV SP, F.ASCE; inducted on October 10, 2017 at the ASCE 2017 Convention in New Orleans, Louisiana. Swallow joins Norma Jean Mattei (2018 past president) and Robin Kemper (2018 president elect) as the first female trio of presidential officers in Society history. The American Society of Civil Engineers represents more than 150,000 members of the civil engineering profession in 177 countries. Through the expertise of its active membership, ASCE is a leading provider of technical and professional conferences and continuing education, the world’s largest publisher of civil engineering content, and an authoritative source for codes and standards that protect the public. 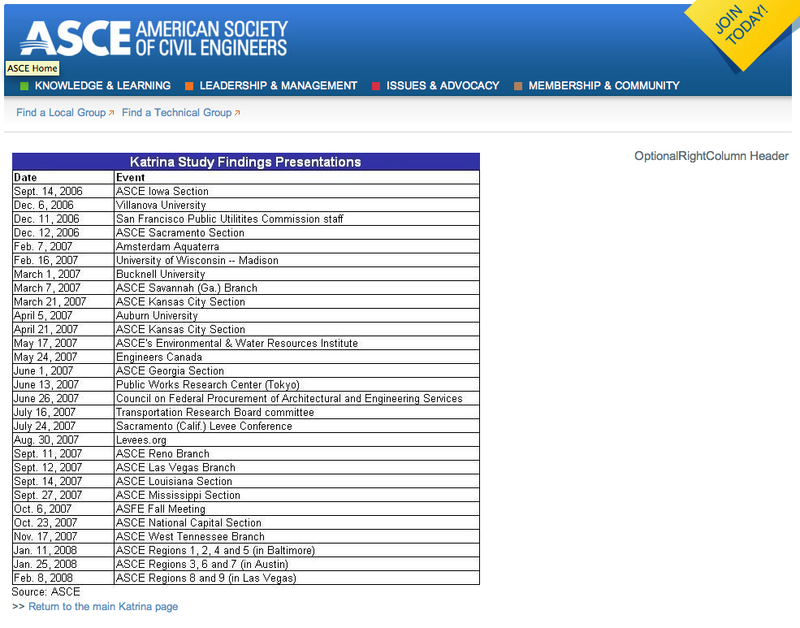 ASCE stands for the "American Society of Civil Engineers". The society was chartered under this full legal name when it was incorporated on April 17, 1877 in New York state. ASCE's membership has long been composed of civil engineers and affiliate members who are not students or classically trained engineers or scientists. ASCE is dedicated to the "...advancement of the science and profession of Civil engineering and the enhancement of human welfare through the activities of society members." It has about 152,000 members in about 177 countries. Its mission is to provide essential value to "...members, their careers, our partners, and the public ... (as well as) ... facilitate the advancement of technology; encourage and provide the tools for lifelong learning; promote professionalism and the profession; develop and support civil engineers". The first serious and documented attempts to organize civil engineers as a professional society in the newly created United States were in the early 19th century. In 1828, John Kilbourn of Ohio, managed a short-lived "Civil Engineering Journal", editorializing about the recent incorporation of the Institution of Civil Engineers in Great Britain that same year, Kilbourn suggested that the American corps of engineers could constitute an American society of civil engineers. Later, in 1834, an American trade periodical, the "American Railroad Journal" advocated for similar national organization of civil engineers. Benjamin Wright. In 1969, the American Society of Civil Engineers declared Wright to be the 'Father of American Civil Engineering'. Other members included Jonathan Knight and Moncure Robinson. Miller drafted up a proposed constitution which gave the society's purpose as "the collection and diffusion of professional knowledge, the advancement of mechanical philosophy, and the elevation of the character and standing of the Civil Engineers of the United States." Membership in the new society restricted membership to engineers and "architects and eminent machinists were to be admitted only as Associates." The proposed constitution failed, and no further attempts were made to form another society. Miller later ascribed the failure due to the difficulties of assembling members due available means for traveling in the country at time. One of the other difficulties members would have to contend with was the requirement to produce each year, one previously unpublished paper or "...present a scientific book, map, plan or model, not already in the possession of the Society, under the penalty of $10." In that same period, the editor of the American Railroad Journal commented that effort had failed in part due to certain jealousies which arose due to the proposed affiliation with the Franklin Institute. That journal continued discussion on forming an engineers' organization from 1839 thru 1843 serving its own self interests in advocating its journal as a replacement for a professional society but to no avail. During the 1840s, professional organizations continued to develop and organize in the United States. The organizers motives were largely to "... improve common standards, foster research, and disseminate knowledge through meetings and publications." Unlike earlier associations such as the American Philosophical Society, these newer associations were not seeking to limit membership as much as pursue "... more specialized interests." Examples of this surge in new professional organizations in America were the American Statistical Association (1839), American Ethnological Society (1842), American Medical Association (1847), American Association for the Advancement of Science, (1848) and National Education Association (1852). During this same period of association incorporations on the 1840s, attempts were again made at organizing an American engineer association. They succeeded at first with the Boston Society of Civil Engineers, organized in 1848  and then in October, 1852, with an effort to organize a Society of Civil Engineers and Architects in New York. Led by Alfred W. Craven, Chief Engineer of the Croton Aqueduct and future ASCE president, the meeting resolved to incorporate the society under the name "American Society of Civil Engineers And Architects". Membership eligibility was restricted to “Civil, Geological, Mining and Mechanical Engineers, Architects and other persons who, by profession, are interested in the advancement of science...”. James Laurie was elected the society's first president. The meetings only went through 1855 and with the advent of the American civil war, the society suspended its activities. The next meeting was more than twelve years later in 1867. A number of the original founders such as James Laurie, J.W. Adams, C. W. Copeland and W. H. Talcott were at this meeting and were dedicated to the objective of resuscitating the Society. They also planned to put the society on a more permanent footing as well as electing fifty-four new members to the Society. With success in that effort, the young engineering society passed a resolution noting that its preservation was mainly due to the persevering efforts of its first president, James Laurie. The address of President James Pugh Kirkwood delivered at that meeting in 1867 was the first publication of the Society, appearing in Volume 1 of “ Transactions,” bearing date of 1872. At an early meeting of the Board of Direction in 1852, instructions were given for the incorporation of the “ American Society of Civil Engineers and Architects” but this was the proper steps were never taken, and therefore this name never legally belonged to the Association. On March 4, 1868, by a vote of 17 to 4, the name was changed to “ American Society of Civil Engineers,” but it was not until April 17, 1877, that the lack of incorporation was discovered and the proper steps taken to remedy the defect. Nora Stanton Barney was among the first women in the United States to earn a civil engineering degree, graduating from Cornell University in 1905 with a degree in civil engineering. In the same year, she was accepted as a junior member of the American Society of Civil Engineers (ASCE), and began work for the New York City Board of Water Supply. She was the first female member of the American Society of Civil Engineers, where she was allowed to be a junior member only and denied advancement to associate member in 1916 solely because of her gender. In 2015, she was posthumously advanced to ASCE Fellow status. ASCE stated that dissemination of technical and professional information to the civil engineering profession was a major goal of the society. This is accomplished through a variety of publications and information products, including 36 technical and professional journals amongst them the ASCE Journal of Structural Engineering, the Journal of Environmental Engineering, the Journal of Hydraulic Engineering, Journal of Hydrologic Engineering, the Journal of Structural Engineering, Journal of Water Resources Planning and Management, Civil Engineering, the Society’s monthly magazine, an online bibliographic database, conference proceedings, standards, manuals of practice and technical reports. The engineering programs division directly advances the science of engineering by delivering technical content for ASCE’s publications, conferences and continuing education programs. It consists of eight discipline specific institutes, four technical divisions and six technical councils. The work is accomplished by over 600 technical committees with editorial responsibility for 28 of ASCE's 33 journals. On an annual basis, the division conducts more than twelve congresses and specialty conferences. As a founding society of ANSI and accredited standards development organization, ASCE committees use an established and audited process to produce consensus standards under a program supervised by the Society’s Codes and Standards Committee. Civil Engineering Certification Inc. (CEC), affiliated with ASCE, has been established to support specialty certification academies for civil engineering specialties and is accredited by the Council of Engineering and Scientific Specialty Boards (CESB). CEC also handles safety certification for state, municipal, and federal buildings, formerly the province of the now-defunct Building Security Council. The Committee on Critical Infrastructure (CCI) provides vision and guidance on ASCE activities related to critical infrastructure resilience, including planning, design, construction, O&M, and event mitigation, response and recovery. To advance its policy mission, ASCE "...identifies legislation to improve the nation's infrastructure, and advance the profession of engineering specifically, ASCE lobbied on legislation at the Federal, State and local levels. Reauthorization of the brownfields revitalization and environmental restoration act. Reauthorization of the national dam safety program and creation of a national levee safety program due to National Levee Safety Act Of 2007, WRDA Title IX, Section 9000. Appropriations for federal programs relating to civil engineering, including surface transportation, aviation, water resources, environment, education, homeland security, and research and development. Lobbying at the state and local level focused primarily upon licensure of civil engineers, procurement of engineering services, continuing education, and the financing of infrastructure improvements as well as lobbying at the state level to raise the minimum requirements for licensure as a professional engineer as part of ASCE's Raise the Bar (RTB) and Civil Engineering Body of Knowledge (CEBoK) initiatives. To promote the Society's objectives and address key issues facing the civil engineering profession, ASCE developed three strategic initiatives, Sustainable Infrastructure, the ASCE Grand Challenge, and Raise the Bar. Education, inclusive of statements on history and heritage of civil engineering, STEM and academic prerequisites for licensure and professional practice laying out ASCE's Raise the Bar and Civil Engineering Body of Knowledge initiatives. Environmental issues, inclusive of statements on acid rain, physical and economic impacts of climate change, pollution management, wetlands regulatory policy, support for the Endangered Species, harmful algal blooms, greenhouse gases and electronic waste recycling. Leadership in Infrastructure Renewal, ASCE makes the argument that the United States needs a "compelling and overarching vision" for infrastructure investment. This statement on infrastructure policy and related reports  laid the conceptual framework for the ASCE Report Card for America’s Infrastructure, related "Failure to Act" reports  and State and Regional Infrastructure Report Cards  and guiding principle recommendations for planning and executing critical infrastructure in the United States. Sustainability, Resiliency and Innovation, ASCE advocates that life-cycle cost analysis should be a part of every new or renewed infrastructure project with funding allocated to develop new and improved techniques in delivering projects, construction engineering and building materials for meeting society's infrastructure needs. This statement on infrastructure policy and related reports  laid the conceptual framework for the ASCE Grand Challenge and related report on the recommended use of life-cycle cost analysis in transportation planning. Regulatory process for infrastructure development, ASCE advocates for strategies that expedite regulatory processes and related decision-making for critical infrastructure projects to "proceed in a timely manner". Its recommendations in this area was for programs to require concurrent reviews by project stakeholders managing design codes (such as UBC and NEC)and other permitting such as wetlands dredge and fill for infrastructure projects. ASCE also recommended the creation of a "single administrative processing/permitting agency" for approving plans for constructing critical infrastructure as well as time-limits on permitting agency decision-making for approving infrastructure project plans. ASCE honors civil engineers through many Society Awards including the Norman medal (1874), Wellington prize (1921), Huber Civil Engineering Research Prize, the Outstanding Projects and Leaders (OPAL) awards in the categories of construction, design, education, government and management, the Outstanding Civil Engineering Achievement (OCEA) for projects, the Henry L. Michel Award for Industry Advancement of Research and the Charles Pankow Award for innovation, 12 scholarships and fellowships for student members. Created in 1968 by ASCE's Sanitary Engineering Division, the Wesley W. Horner award is named after former ASCE President Wesley W. Horner, and given to a recently peer reviewed published paper in the fields of hydrology, urban drainage, or sewerage. Special consideration is given to private practice engineering work that is recognized as a valuable contribution to the field of environmental engineering. The Lifetime Achievement Award has been presented annually since 1999 and recognizes five different individual leaders. One award is present in each category of design, construction, government, education, and management. In July 1946, the Board of Direction authorized annual awards on recommendation by the Society’s Committee on Research to stimulate research in civil engineering. In October 1964, Mrs. Alberta Reed Huber endowed these prizes in honor of her husband, Walter L. Huber, Past President, ASCE. The Huber Prize is considered the highest level mid-career research prize in civil engineering and is awarded for outstanding achievements and contributions in research with respect to all disciplines of civil engineering. The LTPP International Data Analysis Contest is an annual data analysis contest held by the ASCE in collaboration with the Federal highway administration. The participants are supposed to use the LTPP data. The ASCE Foundation is a charitable foundation established in 1994 to support and promote civil engineering programs that "... enhance quality of life, promote the profession, advance technical practices, and prepare civil engineers for tomorrow." It is incorporated separately from the ASCE, although it has a close relationship to it and all the Foundation's personnel are employees of ASCE. The Foundation Board of Directors has seven persons and its bylaws require that four of the seven directors must be ASCE officers as well and the ASCE executive director and Chief financial officer must also be ASCE employees. The Foundation's support is most often to ASCE's charitable, educational and scientific programs. The Foundation's largest program is supporting three strategic areas; lifelong learning and leadership, advocacy for infrastructure investment and the role of civil engineers in sustainable practices. In 2014, this foundation's support in these areas was almost US$4 million. ASCE provides peer reviews at the request of public agencies and projects as a "means to improve the management and quality of [public agency] services and thus better protect the public health and safety with which they are entrusted". After the 2005 levee failures in Greater New Orleans, the commander of the U.S. Army Corps of Engineers (Lt Gen Carl Strock P.E., M.ASCE) requested that ASCE create an expert review panel to peer review the Corps-sponsored Interagency Performance Evaluation Task Force, the body commissioned by the Corps to assess the performance of the hurricane protection system in metro New Orleans. Lawrence Roth, Deputy Executive Director of the ASCE led the ERP development, served as the panel's chief of staff and facilitated its interaction with IPET. The expert panel´s role was to provide an independent technical review of the IPET's activities and findings, as stated at a National Research Council meeting in New Orleans: "an independent review panel ensure[s] that the outcome is a robust, credible and defensible performance evaluation". On February 12, 2007 Lt. Gen Strock gave all expert review panel members an Outstanding Civilian Service Medals. On June 1, 2007, the ASCE issued its expert review panel report, and an accompanying press release. The press release was considered controversial because it contained information not present in the report, conflicting with the report, and minimized the Army Corps' involvement in the catastrophe: "Even without breaching, Hurricane Katrina’s rainfall and surge overtopping would have caused extensive and severe flooding—and the worst loss of life and property loss ever experienced in New Orleans." The report stated that had levees and pump stations not failed, "far less property loss would have occurred and nearly two-thirds of deaths could have been avoided." :39 The ASCE administration was criticized by the Times-Picayune for an attempt to minimize and understate the role of the Army Corps in the flooding. In October 2007, Raymond Seed, a University of California-Berkeley civil engineering professor and ASCE member submitted a 42-page ethics complaint to the ASCE alleging that the Corps of Engineers with ASCE´s help sought to minimize the Corps' mistakes in the flooding, intimidate anyone who tried to intervene, and delay the final results until the public's attention had turned elsewhere. The Corps acknowledged receiving a copy of the letter and refused to comment until the ASCE's Committee on Professional Conduct (CPC) had commented on the complaint. It took over a year for the ASCE to announce the results of the CPC. The ASCE self-study panel did not file charges of ethical misconduct and blamed errors on "staff" and not review panel members having created the June press release." On November 14, 2007, ASCE announced that U.S. Congressman Sherwood Boehlert, R‑N.Y. (ret), would lead an independent task force of outside experts to review how ASCE participated in engineering studies of national significance. ASCE President David Mongan said the review was to address criticism of ASCE´s role in assisting the Army Corps of Engineers-sponsored investigation of Katrina failures. Mongan assured citizens of metro New Orleans in a letter to the Times Picayune, that ASCE took "this matter very seriously and that appropriate actions are being taken". The panel recommended in results released on September 12, 2008, that ASCE should immediately take steps to remove the potential for conflict of interest in its participation in post-disaster engineering studies. The most important recommendations were that peer review funds over $1 million should come from a separate source, like the National Institute of Standards and Technology (NIST), that ASCE should facilitate but not control the assessment teams, and that information to the public and press should be disseminated not under the extremely tight controls that Ray Seed and his team experienced. It concluded that ASCE should draw up an ethics policy to eliminate questions of possible conflicts of interest. On April 6, 2009, an internal probe with the ASCE issued a report that ordered a retraction of the ASCE's June 1, 2007 press release. The panel determined that the press release had "inadvertently conveyed a misleading impression regarding the role of engineering failures in the devastation of New Orleans", that it incorrectly said that surge levels along Mississippi's coastline were higher than water levels caused by a tsunami in the Indian Ocean in 2004, and that it had incorrectly repeated estimates of deaths and property damage in New Orleans that might have occurred if levees and floodwalls hadn't been breached. On November 5, 2007, New Orleans-based grassroots group Levees.org led by Sandy Rosenthal criticized the ASCE's close relationship with the United States Army Corps of Engineers in a spoof online public service announcement. On November 12, 2007, the ASCE asked Levees.org to remove the video from the internet, threatening the organization with legal action if it did not comply. On November 13, the Times-Picayune posted the video on its website. Flanked by lawyers with Adams and Reese in the presence of extensive media coverage, the group ignored the threat and posted the video to YouTube citing Louisiana's Anti-SLAPP statute, a "strategic lawsuit against public participation", which allows courts to weed out lawsuits designed to chill public participation on matters of public significance. In a response for comment, ASCE President Mongan replied, "Since the video has already been widely reposted by other organizations, moving forward, we feel our time and expertise are best utilized working to help protect the residents of New Orleans from future storms and flooding." In March 2008, Levees.org announced that records obtained under the Freedom of Information Act revealed that as early October 2005, the Army Corps of Engineers had directed and later paid the ASCE more than $1.1 million for its peer review (Grant Number: W912HZ-06-1-0001). The grant also paid for a series of misleading ASCE presentations attempting to shift blame away from the corps and onto local levee officials. Members of the ASCE are forbidden from making false or exaggerated statements and also from making statements for an interested party unless this is disclosed. Levees.org claimed the records showed how the external peer review would be done in four phases: Phase 1 was research and analysis on the performance of the levees, floodwalls and other important structures. Phase 2 was provision of information on the current system to prevent future flooding. Phase 3 was provision of information to evaluate alternative approaches to flood protection. Phase 4 was transfer information and knowledge gained to a broader audience within Corps and its consultancy community to communicate lessons learned. The group claimed that these records were proof that ASCE´s routine powerpoint presentation from 2007 and 2008 were a public relations campaign to repair the corps' reputation. ASCE officials responded that ASCE paid for the powerpoint presentations itself and had not used USACE grant money for that purpose. ^ "IRS Form 990 for American Society Of Civil Engineers Group (510202274) for 09/2008 from CitizenAudit.org" (PDF). CitizenAudit.org. Retrieved 7 November 2017. ^ a b c d e ANNUAL REPORT 2016. Reston, VA: American Society of Civil Engineers. ^ "ASCE Founders' Plaque". Metropolitan Section, American Society of Civil Engineers. Retrieved 12 November 2016. ^ Perspectives in Civil Engineering: Commemorating the 150th Anniversary of the American Society of Civil Engineers Jeffrey S. Russell; ASCE Publications, Jan 1, 2003; 392 pages, page 129 "They used the constitution of the Boston Society of Civil Engineers, founded four years earlier, as a framework." ^ "Amit Kanvinde Receives 2016 Huber Research Prize - College of Engineering UC Davis". College of Engineering UC Davis. 2016-04-15. Retrieved 2017-04-17. ^ American Society of Civil Engineers., American Society of Civil Engineers., (1877). Transactions - American Society of Civil Engineers. New York. Accessed at Google Books on November 10, 2017. ^ a b c d e f g h i j k l m Calhoun, Daniel Hovey. The American civil engineer: Origins and conflict. Technology Press, Massachusetts Institute of Technology, 1960. ^ Weingardt, Richard G. (2005). Engineering Legends: Great American Civil Engineers: 32 Profiles Of Inspiration And Achievement. Reston: ASCE Publications. pp. 4–9. ISBN 0-7844-0801-7. Retrieved October 7, 2011. ^ a b c Schlesinger, A. (1944). Biography of a Nation of Joiners. The American Historical Review, 50(1), 1-25. doi:10.2307/1843565 Accessed on November 9, 2017 at JSTOR=1843556. ^ Danuta Bois. "Nora Stanton Blatch Barney profile". Distinguished Women of Past and Present. Retrieved 2011-07-04. ^ "Nora Stanton Blatch profile". IEEE Global History Network. Retrieved 2011-07-04. ^ "ASCE Recognizes Stanton Blatch Barney; Pioneering Civil Engineer, Suffragist". ASCE News. Retrieved 2016-02-10. ^ a b c "Top 10 Achievements & Millennium Monuments" (PDF). People and Projects > Projects. American Society of Civil Engineers. Retrieved 19 September 2012. ^ "ANSI Accredited Standards Developer (ASD) Listing (Large File)". American National Standards Institute (ANSI). Retrieved 10 November 2017. ^ "Institutes". ASCE.org. Retrieved 20 March 2016. ^ "National Levee Safety Program (National Levee Safety Act of 2007 as Amended by WRRDA 2014 S3016)" (PDF). United States Society on Dams (USSD). United States Society on Dams (USSD). Retrieved 10 November 2017. ^ a b "ASCE's Public Policy Committee identified the following federal and state priorities for 2018". American Society of Civil Engineers (ASCE). American Society of Civil Engineers (ASCE). Retrieved 11 November 2017. ^ "OUR INITIATIVES". American Society of Civil Engineers (ASCE). American Society of Civil Engineers (ASCE). Retrieved 11 November 2017. ^ "PUBLIC POLICY STATEMENTS". American Society of Civil Engineers. American Society of Civil Engineers. Retrieved 11 November 2017. ^ "ASCE Policy statement 465 - Academic prerequisites for licensure and professional practice". American Society of Civil Engineers (ASCE). American Society of Civil Engineers (ASCE). Retrieved 11 November 2017. ^ "Policy statement 131 - Growth and development". American Society of Civil Engineers (ASCE). American Society of Civil Engineers (ASCE). Retrieved 11 November 2017. ^ a b c d "ASCE Policy statement 299 - Infrastructure investment". American Society of Civil Engineers. American Society of Civil Engineers. Retrieved 11 November 2017. ^ a b c "ASCE infrastructure policy reports". American Society of Civil Engineers (ASCE). American Society of Civil Engineers (ASCE). Retrieved 11 November 2017. ^ "Failure to Act report series". American Society of Civil Engineers (ASCE). American Society of Civil Engineers (ASCE). Retrieved 11 November 2017. ^ "State and Regional Infrastructure Report Cards by ASCE local sections program". American Society of Civil Engineers (ASCE). American Society of Civil Engineers (ASCE). Retrieved 11 November 2017. ^ "ASCE Policy statement 427 - Regulatory process for infrastructure development". American Society of Civil Engineers (ASCE). American Society of Civil Engineers (ASCE). Retrieved 11 November 2017. ^ American Society of Civil Engineers. "ASCE Honors and Awards - Outstanding Civil Engineering Achievement". Archived from the original on 2008-08-29. Retrieved 2008-08-31. ^ Wesley W. Horner Award Archived 2007-09-27 at the Wayback Machine ASCE. Accessed October 10, 2007. ^ American Society of Civil Engineers. "ASCE Honors and Awards - Lifetime Achievement Award". Archived from the original on 2008-08-29. Retrieved 2008-08-31. ^ Seven Wonders of the Modern World Archived August 2, 2010, at the Wayback Machine ASCE. Accessed June 14, 2011. ^ "Walter L. Huber Civil Engineering Research Prizes". ASCE. Retrieved 2017-04-17. ^ Nehme, Jean (September 29, 2016). "LTPP International Data Analysis Contest". Federal Highway Administration. Retrieved October 22, 2017. ^ Peer Review for Public Agencies American Society of Civil Engineers. Not dated, Retrieved November 17, 2007. ^ ASCE Policy Statement on Peer Review American Society of Civil Engineers, March 17, 2016, retrieved November 13, 2015. ^ a b (March 2007) Members Honored with Outstanding Civil Services Medal Archived 2016-03-04 at the Wayback Machine American Society of Civil Engineers. Retrieved November 13, 2015. ^ Roth, Lawrence "Larry", on behalf of ASCE External Review Panel. (March 20, 2007) Meeting 2, New Orleans Regional Hurricane Protection Projects, Meeting 2, New Orleans Regional Hurricane Protection Projects. New Orleans, LA. Retrieved November 15, 2015. ^ a b Charles F. Anderson, Jurjen A. Battjes; et al. (2007). "The New Orleans Hurricane Protection System: What Went Wrong and Why" (PDF). American Society of Civil Engineers. p. 80. Retrieved 2015-11-15. ^ Joan Buhrman (2007). "Move Beyond Sound-bites and "Armchair" Theories to Make the Nation Safer From Disaster, Engineers Say" (PDF). American Society of Civil Engineers. Retrieved 2015-11-15. ^ (June 19, 2007) EDITORIAL: Sound bites and spin jobs The Times-Picayune. Retrieved November 17, 2015. ^ Raymond B. Seed (2007). "New Orleans, Hurricane Katrina, and the Soul of the Profession" (PDF). New Orleans Times Picayue. Retrieved 2017-01-27. ^ Charpentier, Colley (November 19, 2007). "Critic: Corps tried to thwart inquirty". Times Picayune. Retrieved 2015-11-16. ^ "Levee group slams ASCE investigation" (PDF). NOLA.com. 6 August 2008. Retrieved 27 Jan 2017. ^ a b Schleifstein, Mark (April 6, 2009). "American Society of Civil Engineers finds no ethical violations in its own Katrina levee review". Times Picayune. Retrieved 2015-11-16. ^ a b Sherwood L. Boehlert, Joseph Bordogna (12 September 2008). "Report on Engineering Reviews: Recommendations to the American Society of Civil Engineers" (PDF). Archived from the original (PDF) on 2016-03-04. Retrieved 2017-01-27. ^ Levees.Org (November 5, 2007). New Orleans Levee Spin 101 (Youtube Video). New Orleans, LA: Levees.org. ^ Baquet, Terry (November 13, 2007). "Engineer group not amused by online spoof of levee review". Times Picayune. Retrieved 2015-11-16. ^ Shea, Dan (November 14, 2007). "Controversial Levees.org video". Times Picayune. Retrieved 2015-11-16. ^ a b Betz, Jonathan (December 4, 2007). "Corps/Levees.org". WWL. Archived from the original on 2015-11-17. Retrieved 2015-11-16. ^ Sandy Rosenthal (August 22, 2011). Elite Engineering Group Does PR Show to Protect Corps of Engineers' Reputation (Youtube Video). New Orleans, LA: Levees.org. ^ U.S. Army Engineer Research and Development Center (2006). "Research and Analysis of the Performance of Hurricane and Flood Protection Projects in Southeast Louisiana" (PDF). Department of the Army. Retrieved 2015-11-16. ^ "Katrina Study Findings Presentations". American Society of Civil Engineers. September 2006. Retrieved 2015-11-16.